As an evaluator, I thought I'd check the latest update on benefits of the proposed HS2 high speed rail links – much in the news lately*. It's an interesting read (for geeks!) and there is logic in its detailed analysis. It also assesses the impact on the business case of varying future scenarios, such as changing rates of economic growth and levels of demand. The rationale for HS2 is partly an issue of capacity. If rail travel continues to grow, the existing network will be unable to cope. It's also about economic benefits, particularly to “The North”. This is based on detailed economic modelling, which is not my specialist field, but the principle is that (as well as leisure travel) people need to get together to do business. That business creates growth, which delivers the economic benefits. HS2 describes itself as “An engine for growth”. The capacity issue is demonstrated by the graph, taken from the latest report. 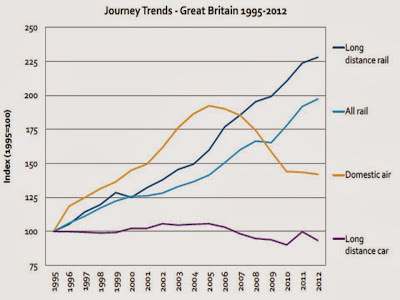 It shows rail travel growing much faster than road or domestic air travel, which over the past 10 years have actually declined. This is despite air travel presumably being much faster (OK, maybe not door-to-door, but the same could be said of HS2). The economic argument shows a positive benefit to cost ratio, currently around 2.3:1 for the ‘standard case’ scenario. However, even if you accept this ratio, it doesn't mean that HS2 is necessarily the best way to spend that £50 billion. Many argue that a similar investment in schools, hospitals and other public services would be more valuable still. The counter-argument is that investment in business creates wealth which in turn generates the money for just these wider social projects. Where you stand on this is a question of values and political beliefs (e.g. the extent to which you believe in "the trickle-down fairy"), rather than of HS2 by itself. So am I convinced? Well, not yet, for two reasons. Firstly, I’ve not yet seen enough cause-effect analysis. 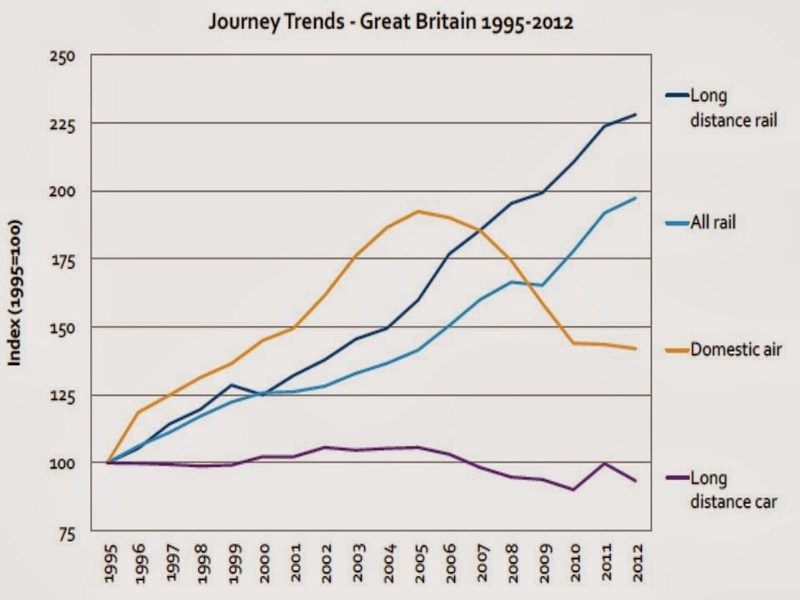 I want to know why road and domestic air travel have declined whilst rail travel (despite all our complaints about high fares) has increased. Without that understanding it is difficult to have confidence in the projections. Second, should we be thinking communication rather than just travel? I'd also like to see on that graph the growth over the same time in non-face-to-face communication – Internet, teleconferencing, Skype and so forth. Sure, people buy from people, but it seems dangerous to assume that we will forever need to meet face-to-face. I've just run a workshop where one participant joined us by Skype from India. Not as good as being in the room but it worked OK. I wonder if, within a generation, meetings will consist of holograms sitting round a table whilst their owners participate from remote locations around the globe (I’m sure the technology for this already exists). And the demand for rail travel them? There is no perfect answer of course. It's a fact of life that the further into the future you predict, the more your chances of being proved wrong by factors yet unknown. Some HS2 projections look ahead almost 90 years, and Dr Beeching shut down rail lines that had been running much less time than that (because the impact of motor transport had been underestimated). We probably have to accept that HS2 is a gamble whether we build it or whether we don't. Personally, I would like to see the decision based on comparing it with investing in alternative communications technologies, rather than trying to catch up with 20th-century technology.